Having a furnace that won’t turn on can be quite frustrating, especially when there’s negative temperatures outside. When you find yourself in a situation like this, start by diagnosing the problem with the help of the information below. If after you’ve performed all the diagnostics your furnace still won’t kick on, then you’ll want to call a professional. The first thing you want to do if your furnace won’t kick on is to check and see if the thermostat is set to heat and not the air conditioning function. In addition to this, make sure that the thermostat is set to a temperature higher than the temperature of the room. Typically, you should set your thermostat’s temperature to about 5 degrees above room temperature. You’ll also want to make sure that your thermostat is not broken or needs to be recalibrated. These problems can also cause your furnace to not start. Repairing the thermostat is not a tough job, but if you need your thermostat recalibrated, it’s best if you call a professional to take care of the job. Another thing you want to check is to see if your thermostat actually has good batteries in it. Many thermostats require batteries, and when those batteries become dead, your furnace can neglect to turn on. Make sure your furnace is turned off. Check the switch on your unit. Head to the circuit breaker panel and open it up. Look to see if you see a tripped breaker. If you do see a breaker that has been flipped. Push the switch to OFF and then to ON. Turn the power back on the furnace. While you’re making sure your power is turned on, you should also make sure that the cords are not damaged or defected in any sort of way possible. Locate the blower compartment with the inspection window. Look and make sure that you see a flashing green light. If you see a flashing red light or no light at all, your blower is more than likely broken. If it’s not your blower that’s broken, it could also be your transformer, your run capacitor or your control board. When one of these parts is not working properly, it can prevent your furnace from starting up and producing heat for your home. In this situation, it’s best to have a certified technician look at your system and make any necessary repairs. If you have several supply registers closed throughout your house, you may want to think about opening them up, especially if your heat won’t come on. Having more than 20% of your registers closed can result in a heat build-up in your furnace. 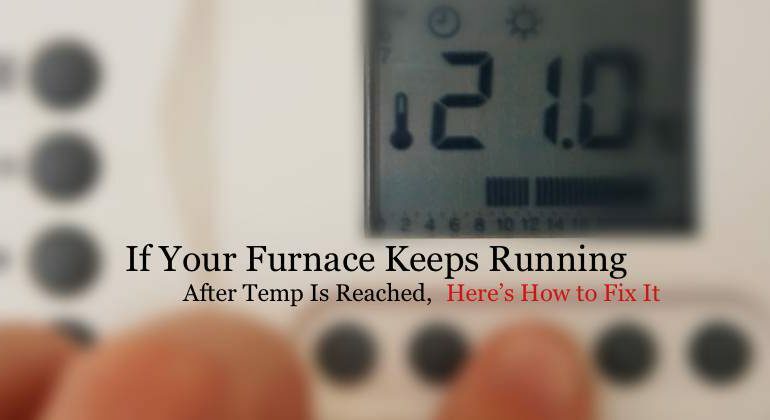 When your furnace gets too hot, it will begin to overheat and eventually it will automatically shutdown. To prevent this from happening, walk though your home and make sure all the vents are opened. It’s also important to make sure that there’s no curtains, furniture, rugs or anything else covering the opening of the supply registers. When your furnace won’t kick on, check to see if the pilot light may have went out. If your furnace is located by a door leading to the outside or you had a fan running near your furnace, the breeze could have extinguished the pilot light. However this may have happened, you will need to relight it. It’s important to note that automatic ignition furnaces do not need to be relit. Most of these furnaces were manufactured and installed after the year 1990. On the other hand, standing pilot furnaces do need to be lit. These furnaces were manufactured and installed generally before 1990. With the furnace door removed and the power turned off, look to see if you see a flame. If there is no flame present, locate the furnace control valve and flip the switch to OFF. You’ll now want to wait a few minutes. Equip yourself with a match or even a barbeque lighter. After a brief break, flip the switch to PILOT on the control panel. You’ll want to hold in the PILOT button while you light the pilot. You’ll also want to continue to press in the power button until for a few moments after you light the pilot. Turn knob from PILOT to ON. You’ll want to do this gradually. Look for a flame, and if you see one, put the furnace door back on and turn back on the power. If you own a gas furnace, make sure that your gas line has not been accidentally turned off. When you’re involved with more than one home improvement project at a time, this can happen, especially if you’re in the middle of a kitchen remodeling project. It’s also important to make sure that none of the pipes damaged or leaking. If you smell the odor of gas inside of your home, get out quickly and call a professional right away. Recently had gas line repaired outside the house. All gas appliances started working except furnace. Could air in line from testing cause an issue? My furnace is in attic.